Dubai: A hospital for a birthday party venue is perhaps unheard of. But little Rania’s parents could think of no better place than the Mediclinic City Hospital in Dubai to mark her first birthday on March 31. 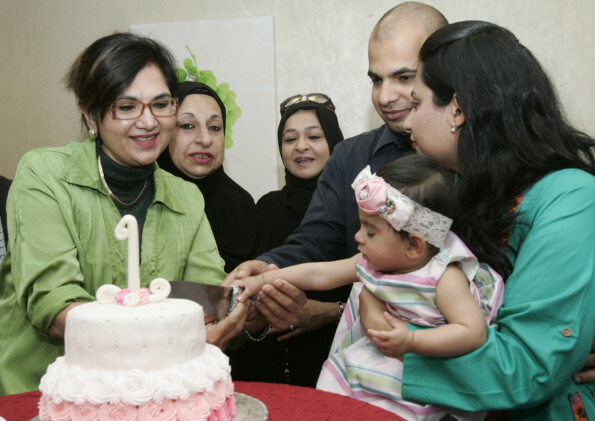 As Rania cut a two-tier butter cream rosette cake at the hospital, her parents Somaiya and Fahad Iyoob, Pakistan-born Canadians, said it was a special moment being shared with special people --- the doctors and nurses who saved her life. In the pink of health, Rania wore a pink outfit with a rose head band that matched the roses on the birthday cake, the harmony belying the ordeal she and her family went through when she first arrived. Born prematurely at 26 weeks, Rania’s first birthday was as much a celebration of survival as it was a tribute to the people who made it possible. Dr Azizunnisa Shaikh, Specialist Obstetrician and Gynaecologist, recollected the difficult circumstances under which Rania was delivered. Hospital Director Dr Tarek Fathey presented a small gift voucher to Rania on behalf of the staff.